A lexicon of terms has been written by theorist Stephen Wright for the Museum of Arte Útil and will serve as a textual tool kit for users. The lexicon includes terms that Wright feels should be 'retired' alongside what he refers to as 'emergent concepts' and 'modes of usership.' Stephen Wright is a writer and professor at the European School of Visual Arts. 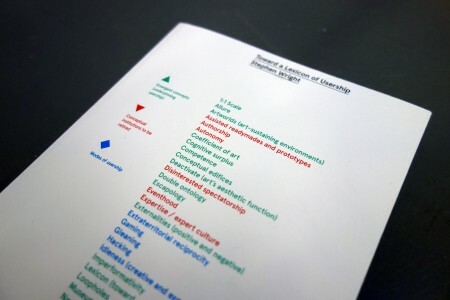 Toward a Lexicon of Usership is edited by Nick Aikens and Stephen Wright and designed by Collective works. The design and scenographic conception of the Museum of Arte Útil was developed in collaboration with constructLab a collaborative group of architects, designers and intellectuals constructLab (with Alex Roemer, Bureau d' Études, Collective Works and others). Unlike the conventional architectural process in which the architect designs and the builder builds, in constructLab's projects conception and construction are brought together. The construction site is the context in which the project can be enriched by unexpected opportunities that happen on site. For the Museum of Arte Útil constructLab introduced the notion of the Social Power Plant, conceiving the physical space of the museum as a site for collaborative, generative action that can be taken in to the world outside. Working on site for two weeks a team of twelve designed and built the physical spaces of the rooms. Working collaboratively and spontaneously with artists and workers of the museum, this synergy has resulted in a collective work that allows for others to use and intervene how they see fit. A museum can become a social power plant when users, curators, artists and employees of a museum come together to create different forms of agency that serves different values: the pollination of a culture of commons, struggle against private interest and the use of a social decision process. 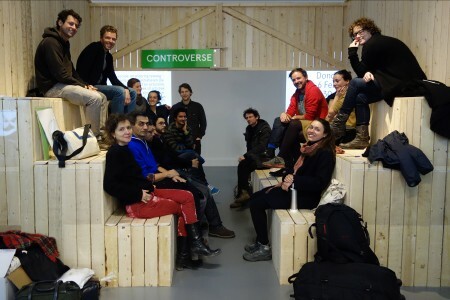 Arte Útil projects are the resources for the social power plant, which processes and reactivates them to make proposals for use in local situations. - an incubating process produces the basis for social transformation by repurposing use. In the Museum of Arte Útil, this process takes form through the game which re-employs arte utile projects as prototypes or models for local situations. - a generating process is the fabric for social self-organisation. It operates through a boiler (discussion, debate) and by using social batteries (common resources). In the Museum of Arte Útil, this process takes form, before the exhibition, through the multiple discussions and social decision processes between curators, artists and employees. - a disrupting process stops or hijacks contested social uses, social functions or existing organization. It operates through disjunctors, surprises or breakers. 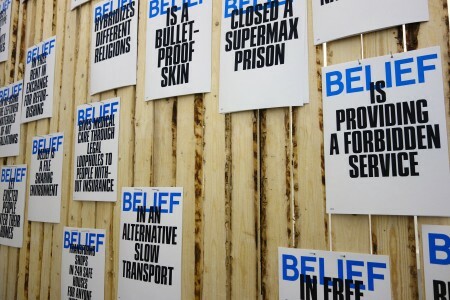 In the Museum of Arte Útil, this process takes form with the contradiction between the institutional constraints (making an exhibition in a classical way, refusing some projects which challenge the legitimacy of the museum, reproducing standard ways the museum produce a scenography) and the desire of the artists to implement new operations in the museum (for example, employing illegal refugees for the montage of the exhibition to give them a legal status). - a catalysing process is produced through the aggregation of the three preceding operations. In the Museum of Arte Útil this process take the form of the exhibition itself. - a pollination process operates by emulating or amplifying an incubating, a generating or a disrupting process. The pollination process is a tool for the other processes to be empowered. 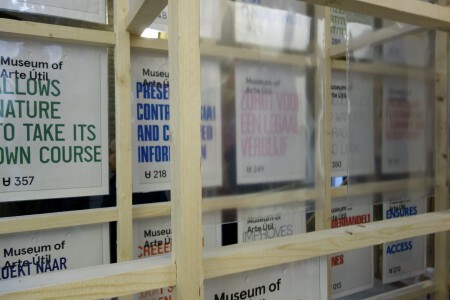 In the Museum of Arte Útil it takes form when an Arte Utile project is realised in Eindhoven. - a transmuting process includes models, prototypes or simulations which, through concepts, images or construction make proposals for new uses or social practices. 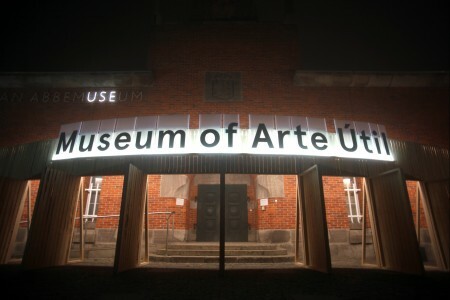 In the Museum of Arte Útil, this process takes form if the Van Abbemuseum becomes a Museum of Arte Útil permanently. The Museum of Arte Útil as a social power plant is a place of resources, research and production. The ideas presented are part of a debate, without a clear nomenclature. Some prototypes are in process but can be challenged in the Room of Controversies. - The white walls of the institution presents projects extracted from the Arte Útil archive. these two approaches (institutional and social power plant) are articulated in each room through seven strategies such as Use it Yourself' Institutional Repurpose. The archive in the central room is the heart of the Social power plant. It is articulated through a map and a game. The map of the social power plant in the archive room presents case studies, which are disseminated through time and space. They are all part of a global social power plant, which works together to transform societies. As part of the Museum of Arte Util, Collective Works (The Hague) are acting as messengers between the physical site of the museum and the city of Eindhoven, linking activity from inside the power plant to the city and back again. This will happen through their own observations, commissioned tasks (by the museum, possible users or participating artists) and as an initiator of a series of workshops. Using the wooden wall as a tool and documentation display the messenger focuses on the representation of urgent questions, fresh insights and different forms of activation. Specific topics will be developed in collaboration with the museum and local users.